With BIGBANG’s long awaited comeback making an all-kill across all music charts, VIPs (an affectionate term for fans of BIGBANG) are in for another round of excitement as the group announced their 2015 World Tour [MADE], which included Singapore, Hong Kong, Taiwan, Thailand, Malaysia, Indonesia, Japan and more. Get ready to witness this spectacular concert as BIGBANG makes their way to our little red dot to perform for two nights! 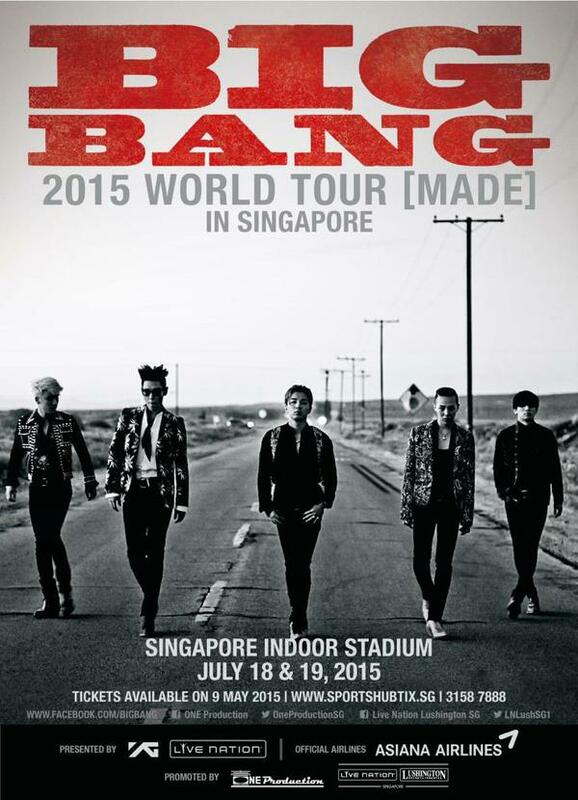 VIPs, are you ready to rock Singapore Indoor Stadium? For seated, it includes a sound check pass, VIP laminate and merchandise item. For standing, it includes a sound check pass, VIP laminate, merchandise item and priority entry. Ticket sales will commence on 9th May 2015 (Saturday), 10AM via www.sportshubtix.sg, hotline +65 31587888, Sports Hub Box Office & all Singpost outlets. The vip package only applies to $368 catergory or for all? What does it mean “VIP pqckage”? Do we have to be part of VIP fanclub to be eligible to purcahse the tickets? Nope the VIP package is only for the VIP seat. Its not only seating. Its for BOTH $368 standing AND seating. Any guest on that day? Hi there! I purchased the VIP standings tickets this morning, I was wondering how do we know when is the soundcheck, when the merchandise items & VIP laminate will be given out? And how does the priority thing goes? Thank you! standing vips is sold out on that day within an hr after the sales commence. So i bought vip seating , then i realise , how could it be vip seating when its far away from the stage? while cat 2 which is $228 standing in pen b was much worth it! Now i regret! I dun mind paying more as long as its really worth it. I think vips seating should be moved near the vips standing and the cat 2 pen b should be moved to the side. I think thats more reasonable. T.T woke up early to get the tixs but due to fast selling website overwhelm , i miss the spot.